The first large racing catamaran from my design board, done for a group of three Auckland racing enthusiasts. 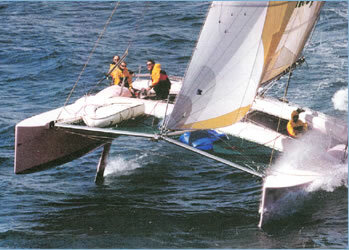 The craft has been extremely successful over a race history period of almost 18 years. Record holder of the New Zealand Annual Coastal Classic Race from Auckland to Russell, Bay of Islands. This record was set in October 1996 with an elapsed time of 7 hours, 20 minutes for 124 nautical miles!! Third time only in NZMYC history that a yacht has won both Line and Hcp in one season.